Immunogen: Native rat Cytochrome p450. 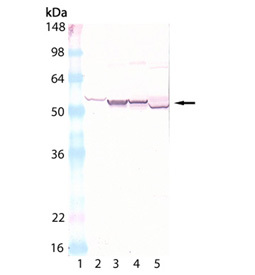 Application Notes: Detects a band of ~50-55 kDa by Western blot. Scientific Background: Cytochrome p450 is a highly conserved and diverse family of heme-containing proteins that function in the metabolism of numerous endogenous and exogenous substrates.. The human genome encodes 57 p450 genes divided among 18 families, which together account for the diversity of substrates metabolized. p450 is the primary conjugating enzyme in phase I metabolism and detoxification of endogenous and exogenous compounds, and are primarily localized to the inner membranes of mitochondria and the ER. Eukaryotic microsomal cytochrome p450 enzymes receive electrons from the FAD- and FMN-containing enzyme NADPH:cytochrome p450 reductase (CPR). Western blot analysis of Cytochrome P450: Lane 1: MWM, Lane 2: Human Liver microsomes, Lane 3: Rat Liver Microsomes, Lane 4: Mouse Liver Microsomes, Lane 5: Rabbit Liver Microsomes.